Bar one or two notable exceptions any car model in production for over seven years is living on borrowed time. Botoxed at four and barely selling at six. I know, I know tell us something we don’t know. Again, apologies for stating the bleeding obvious, but when it does get replaced we will be told how great the new model is. How it improves on it’s predecessor in every possible way. The guys with slicked hair and pointy shoes might just barely desist from telling us how foolish we were to buy that old thing they were selling last week. They will exhort the buying public to immediately upgrade to the shiny new bauble, which will in fairness possess features and functions that a couple of decades ago would have seemed like science fiction. Is newer always better though? Maybe sometimes…. There’s really nothing left to say… Just breathtakingly beautiful. The 11.6 years average production run of a Mercedes Benz SL roadster is almost double that of a typical production car. This reasons for this could be explained in different ways. The most obvious is the expense of developing a new car needs to be recouped and with a niche low volume (albeit expensive) car (which probably has lots of bespoke components) those costs take a lot longer to amortize. Mercedes would undoubtedly tell us that they are designed in a timeless, classical style and don’t date the way a “lesser” car might. 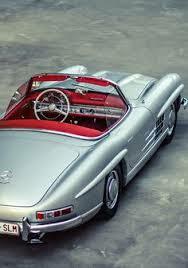 1954 brought us the first SL. Sketched by perhaps the most influential car designer of the 20th century, Friedrich Geiger. Only 1400 (coupes) ever made. It certainly was sporty. It brandished well over 200hp from it’s three litre straight 6 (theoretically 260 kph was possible making it the fastest production car of it’s time) and was light(ish) the scales telling us it nudged 1560kg. There was nothing like it at the time and there has been so much written about it’s genesis, it’s performance and it’s “Gullwings” I certainly won’t be adding anything interesting or original to this canon. A year after it’s launch came the prototype SL (ie. 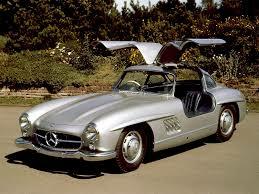 convertible) and the slightly more affordable, yet some might say underpowered 190SL. Suffice to say I love it and the next time I find the guts of a million quid down the back of a sofa I’ll be straight off to Hemmings. Gun metal grey please. Time moved on and as the ’50s drew to a close Rudy Uhlenhaut and Geiger asked Paul Bracq and Bela Barenyi to design the new SL. Has there ever been a more challenging brief? Probably not, but these two guys really stepped up to the plate. 1963 saw the launch of this instantly recognisable classic. It’s gossamer light look was complemented by the use of aluminium giving us a car that at 1295kg truly was the “leicht” promised in the car’s name. At a mere 4.3 metres long it is the smallest, lightest most graceful of all SLs. They did seem to forget the “Sport” part though. At launch there was only 150hp on offer. Even the runout 2.8l straight 6 could only manage 170hp and although the car was very nicely set up it certainly wasn’t as sporty (or expensive) as it’s predecessor. There has never been a more perfectly proportioned rear. Has there ever been successive models from any manufacturer that were better known by their nicknames? That were instantly identifiable to everyone, car lovers or not? If so I can’t think of them. These two cars had the shortest production runs of any SL (9 years for the Gullwing and a paltry 8 for the Pagoda). Coupled to these “short” production runs were relatively small production figures (under 30000 total for all three original SLs and under 50000 for the Pagoda) and with the youngest of these cars turning 45 this year these cars are becoming more and more exclusive and expensive. Surely that’s only right and proper for cars that were designed to be so. This was as powerful as the W113 ever got. When in reflective mood I’m pretty sure I prefer the look of the exquisite “Pagoda” but already it didn’t really do what it said on the tin. The downward spiral had already begun. Five years after it hit the streets Friedrich Geiger sat down with Joseph Gallitzendörfer to pen the next model in this elegant and upmarket series. Could Geiger reverse this incipient trend and end his illustrious career by pulling one final jaw dropper from up his sleeve? Is it even possible to go upwards from here? Thanks for that. The second SL is the one for me: it’s perfectly sized. Goodness, but isn’t the sculpting very subtle? Not all German cars are about severe minimalsm. I recognise the location for the gold car. That dealer often has Bentley and Porsches as well as higher to very high end Benz cars. You’ll also see quite badly neglected ones parked there too, like the 500 SL which I saw last summer: tree sap, dents and footwells full of rubbish. I find his Jaguars and Bentleys more attractive than the later MBs or Porkers. With Ireland’s Anglo-Saxon influence and maritime climate the UK cars fit in better. 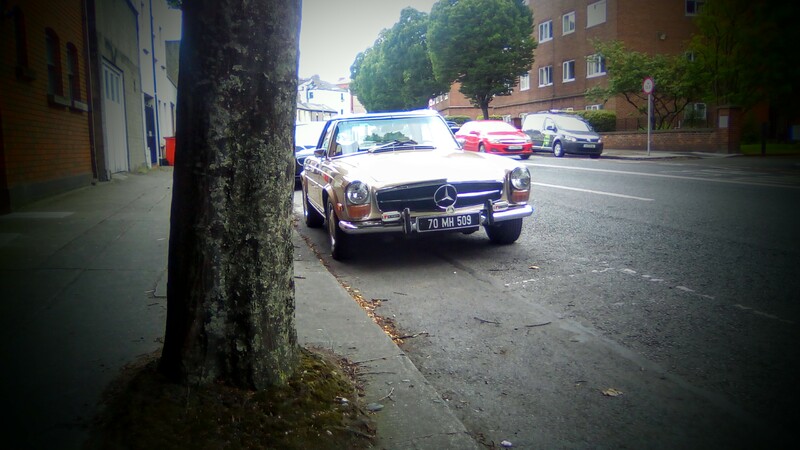 The only Mercedes in Dublin ought to be taxis. 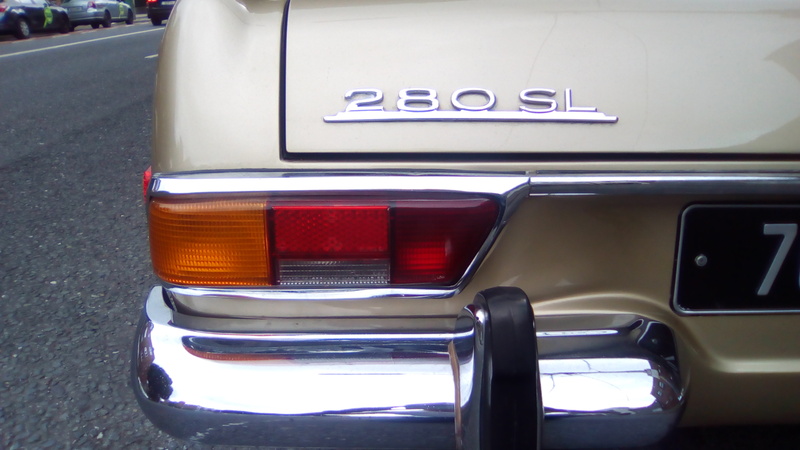 I’ll have a little think about long running *good* cars…. Thanks Richard, you are bang on about the location and there is a variable but often interesting mix of high end cars parked outside. Sometimes there are very expensive cars inside. The pagoda makes me stop and stare every time I see one. That dealer also has the odd Ferrari, doesn´t he? Can you say where you might go looking for a classic car in Ireland? The listings are rather scant, aren´t they? Even general Google searches turn up very little. If you want a high-end car like a Jaguar or old Mercedes, it´s not too hard to get a hold of one. It´s the “ordinary” cars that are in very short supply. I bet there are more 1970s Ferraris in Ireland than Ford Cortinas or Sierras. He has the odd Ferrari and I’ve even seen a Lambo or two there. There are plenty of Bentleys, Astons and the like with regs between 2000 and 2007 but if you want an everyday classic (old Fords, Citroen or even Beemers) they tended not to be very well kept. 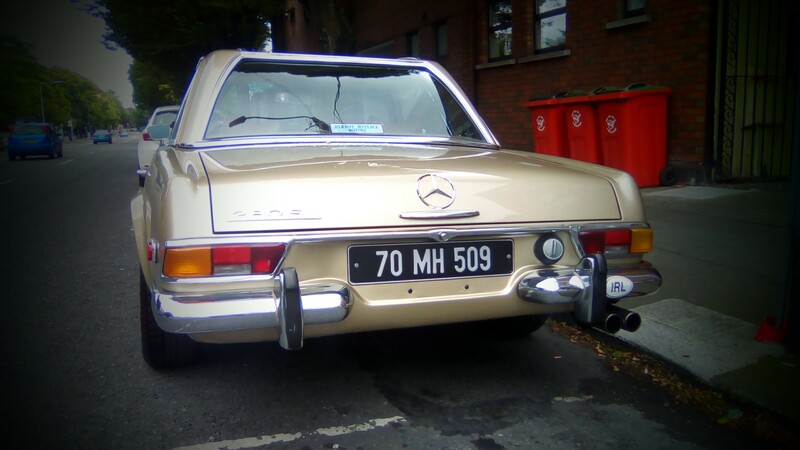 I think 70/80% of decent 30/40 year old cars on the road in Ireland have been imported. One in four 911s is left hand drive. Some other models get worse with age as well. The Jaguar E-type, during its stint at the top, went through 3 stages, and the first was definitely the best. (not that I like any of them, to be perfectly honest.) Plus, the Golf is definitely worse off now than it was, better technology and drive but just so much less character than the little MK1. Very true about the mark 1 golf Tiagaboy. We had one at home when I was growing up(mind you it was a painfully slow and loud diesel, a mere 54hp I think) and I still love how they look. They seem to be becoming quite rare now.